OraMD Oral Hygiene Program Review & Giveaway Ends 7/10! Do you suffer from gum disease? Bleeding gums? Swollen gums? Bad breath? If you answered "yes" to any of these, keep reading because I may have found a solution for you! I recently had the chance to review a product called OraMD. When I was reading about the product and what it claims, I thought "wow, I can't wait to try this!" OraMD is scientifically formulated using 3 botanical oils: peppermint, almond and spearmint. The product is safe for ages 3 and up! The peppermint has highly potent antimicrobial, antibacterial, and antifungal properties. The spearmint has anti-inflammatory, antiseptic and anti-spasmodic properties and is highly efficient at killing several varieties of bacteria. The almond oil is an emollient that allows the peppermint and spearmint to do their jobs. 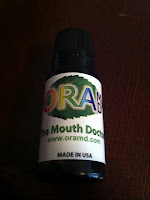 OraMD is a complete oral hygiene program in ONE bottle. No more purchasing multiple products to get the job done. It acts as a liquid toothpaste, mouthwash and breath freshener all in one! Brush 2x daily, morning and evening, using 2-5 drops of OraMD on a toothbrush and brush normally. Floss every evening before brushing to remove any food particles. Use OraMD as mouthwash, 2x per day, morning and evening. Put 2-5 drops in an ounce of water, swish and gargle. Mid morning, mid afternoon and as needed: put 2-5 drops on the tip of your tongue to coat the gum line and teeth to kill bacteria and keep breath fresh. It took a couple of days to get used to this program as it is different from my normal oral hygiene routine. I started using 5 drops for each part of the routine. I found the OraMD to have a pleasant minty tingling taste to it but found that for me, it was a bit strong so I stuck with only using 2 drops for each part of the routine. This suited my personal taste and tolerance much better. Over the course of the time I have been using OraMD, I have noticed that my breath is much fresher during the day, my gums aren't as red and inflamed as they had been and there is no blood on my brush or in the sink after spitting anymore. I suffer from gum disease and it seemed like it didn't matter what products I used or how well I took care of my teeth and gums, it was still an issue. I am seeing improvements after only about 2 weeks of use. I believe with continued and long term use, my mouth will continue to improve. I would recommend this product to anyone who has any gum/teeth/mouth issues and have not been successful in the past with other products or expensive dental treatments. For that matter, try this BEFORE resorting to expensive dental treatments and/or surgeries. You can purchase OraMD at their website for $22.97 per bottle. The cost is reduced when you buy more bottles at one time. Three lucky readers will each win a bottle of OraMD! You must be 18 or older to enter and live in the US. Giveaway ends 7/10/12 at 11:59 pm eastern time. 3 winners will be picked using Random.org and emailed. Winners will have 48 hours to respond or a new winner will be picked. Please use the Rafflecopter form to enter! I really didn't understand how and why gums would bleed. Re: pocket forming great review, I would love to try this. I like the fact this is natural and can even be used on young children. Sometimes my gums bleed and this would be great to try. Almost all toothpastes have an ingredient in them called Sodium Laurel Sulfate (SLS) which is used to suds up your toothpaste. The problem with SLS is it is used in clinical studies the world over to irritate your skin. Sodium Laurel Sulfate is a harsh chemical that has been used as a car wash soap and garage floor cleaners. After decades of putting a skin irritant in your mouth twice a day, it's no wonder your gums are having problems. I learned that the oils from this product will naturally seep into soft tissue in the mouth, and penetrate deep down to kill harmful bacteria where it grows. I like that since it is an oil it can coat more of your teeth beneath the gum and get at that bacteria! I learned that floride has been banned in several countries like Germany, China, Austria, France, Finland, Belgium, Denmark and many more. I learned Whether you use the product we recommend or go to Wal-Mart and purchase the standard brands of toothpaste and mouthwash you're going to end up paying about $14.00 a month, a little under 50 cents a day (see costs), for a good oral hygiene program. It is a natural product which is awesome. The product is all natural. I learned that it doesn't have Sodium Laurel Sulfate, which irritates the gums. It sounds great! There are no nasty chemicals in these products! The product is all natural with no sodium laureth sulfate. I learned to use a toothbrush w/ nylon bristles, which will last longer with their program. Almost all toothpastes have an ingredient in them called Sodium Laurel Sulfate (SLS) which is used to suds up your toothpaste. The problem with SLS is it is used in clinical studies the world over to irritate your skin. Some cheaper brushes use plastic bristles, which will not hold up to the potency of OraMD’s powerful botanical oils. Make sure to use a brush with soft nylon bristles. Most name brand brushes are made of this material. Rinse the brush thoroughly with warm water after brushing. Avoid using foam cups, polystyrene plastics will not hold up to the menthol in this product. 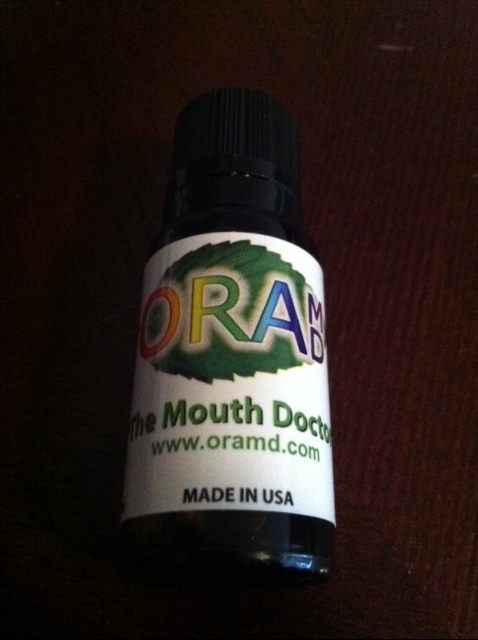 The oils from this product will go into soft tissue in the mouth. I like that it is an oil and can coat and be absorbed more readily beneath the gums. I learned that gum disease causes more tooth loss than any other dental problem, like tooth decay.